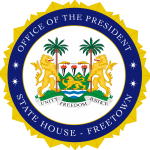 State House, Freetown, Monday 17 September 2018 – His Excellency President Julius Maada Bio has received at State House and commended Peace Corps volunteers from the United States of America for their work in Sierra Leone, especially for their support to education and health. He said that the initiative was great and that Sierra Leone had benefitted a lot from the scheme, noting that the volunteers had, over the years, provided assistance to the health sector in rural Sierra Leone. He said his government was committed to working together and in consonance with the volunteers for the good of all Sierra Leoneans. “You have contributed immensely to education in our country. I have said education is very important for the formation of any individual and also a foundation for development. I value education a lot and that is why my government has brought in the free education program that will support the less privileged in society,” he said. American Ambassador to Sierra Leone, Maria E. Brewer, who was part of the visiting team, thanked President Bio for the time accorded them. She said the Peace Corps has been sending volunteers to the country since the early 1960s, to help with improvements in various sectors of the society. Ambassador Brewer added that their activities were in tune with the New Direction agenda, especially in areas of education and health. She ended by assuring that the US government was ready to partner with the new administration on its programmes. Peace Corps Volunteers work at the grassroots level to create change that lasts long after their service.